WB Walkie, ER Walkie/Rider pallet trucks, CR Series center rider pallet trucks, ST Series walkie stacker pallet trucks, CB Series counterbalanced walkie stackers, and TR100 tow tractor are certified Class III by Industrial Truck Association. 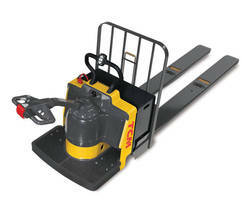 Featuring DC power, WB Walkie, ER Walkie/Rider pallet trucks have load capacity of 6,000 and 8,000 lb. Available in single or double pallet models, CR Series center rider pallet trucks have load capacity of 6,000 and 8,000 lb.